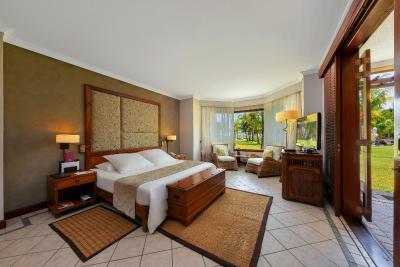 Lock in a great price for Dinarobin Beachcomber Golf Resort & Spa – rated 9.2 by recent guests! Amazing and outstanding holidays spent at Beachcomber Dinarobin resort. Everything was perfect and exceeding our expectations. Thank you Beachcomber Dinarobin! We liked everything especially the food at the buffet, the rooms, access to different hotels and swimming pools. Fantastic hotel!!! Nice resort. The best part is the water sports area and the breakfast. Nice beaches. Comfortable room. Special thanks to Kevin from the sports area who got us a table for dinner, Jeremy from the front desk and Jessica, the housekeeping manager who went above and beyond to resolve a situation we had. THANK YOU ALL!! Really amazing place for a vacation. 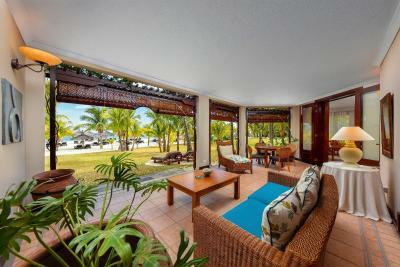 Dinarobin and Paradise both belong to Beachcomber, so you get access to the facilities of both hotels. That is 5 kilometers of beatiful sand beaches, free padling, kayaking, windsurfing, snorkling. Food is of rather good quality, the stuff is very friendly and helpful, the rooms are cosy and spacious. Loved it All! Would go back again as it was amazing experience. Great that you can use both Dinarobin and Paradis resorts. Perfect for couples or families. Great water sports choice. Great food. Lovely, lovely resort with stunning scenery and amazing service. Lovely welcome at the reception. We found it to be pricey, but worth it in terms of the nice room, the service and the pool/beach. The staff was super helpful with our 3 month old baby e.g. through providing not only a cot, but also a diaper bin, mosquito net, kiddy bath amenities and a bottle warmer. We were also allowed to stay a bit longer in our room after check out time, which was offered without us asking. The personel was very nice , never a problem. the gardens were perfectly groomed. The beach very clean. There were enough restaurants that we could change every day. The food was very good. A perfect holiday. Everything was superb. The room and outside area gives you all possibilities to enjoy and relax. Both restaurants are really good and the service there is also very good. It is worth the money! I would also recommend to use the Spa, the staff there was amazing and the treatments are awesome. Dinarobin Beachcomber Golf Resort & Spa This rating is a reflection of how the property compares to the industry standard when it comes to price, facilities and services available. It's based on a self-evaluation by the property. Use this rating to help choose your stay! With Le Morne Mountain in the background, this resort features elegant, air-conditioned suites surrounded by lush, tropical gardens. Guests have access to the Paradis Golf Course, just a 2-minute drive away. 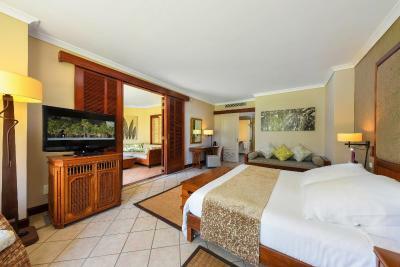 The spacious suites at Beachcomber Dinarobin include free Wi-Fi and a sitting area with a flat-screen TV. All rooms have a balcony and some offer views of the Indian Ocean. Each suite has a modern bathroom stocked with free toiletries. Relaxing massage treatments are available in the spa, which includes a sauna and a gym. A personal trainer is available upon request. Glass-bottom boat tours and snorkeling trips are organized by the 24-hour staff. Dinarobin Hotel Golf & Spa has 4 restaurants, including a beachfront restaurant. 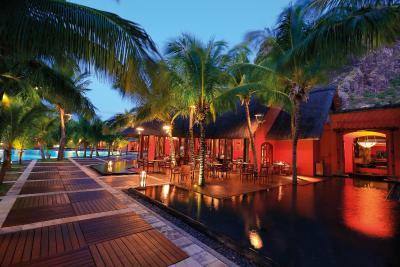 Guests also have access to the restaurant and facilities at Beachcomber Paradis. 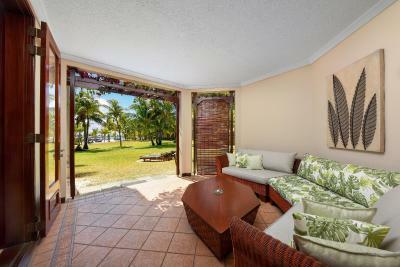 This property is also rated for the best value in Le Morne! Guests are getting more for their money when compared to other properties in this city. When would you like to stay at Dinarobin Beachcomber Golf Resort & Spa? Elegant and air-conditioned suite on the lower floors with balcony. It also has seating area including a flat-screen TV with satellite channels and a modern bathroom with free toiletries. Please note some of these units are located on the upper floor. 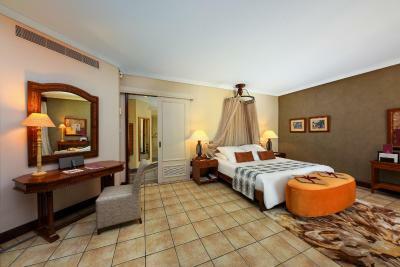 This spacious, air-conditioned suite is located on the hotel's lower floors and closest to the beach. 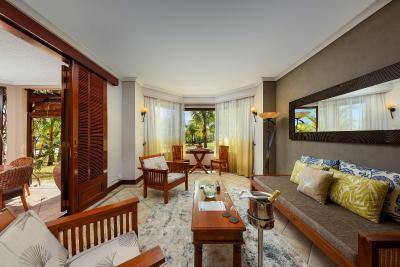 It features an elegant décor and a balcony overlooking the lush tropical gardens, pool and Indian Ocean. The private bathroom features a large walk-in shower and a separate bathtub. Please note that this room rate is subject to the travel dates being within 1 year of the guests wedding date. A copy of the wedding certificate should be produced at time of check in. Failure to do so will result in guests being charged the difference in rate directly at the hotel. This elegant and spacious suite offers a private terrace, an private bathroom with walk-in shower, bathtub and wardrobe. 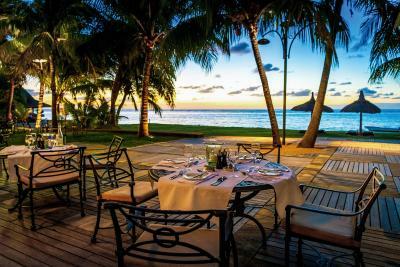 "An elegant five-star resort in Mauritius, Dinarobin Hotel Golf & Spa is a haven of peace and tranquility - the ideal setting for your luxury holiday in Mauritius and the perfect sanctuary to renew your body and soul. 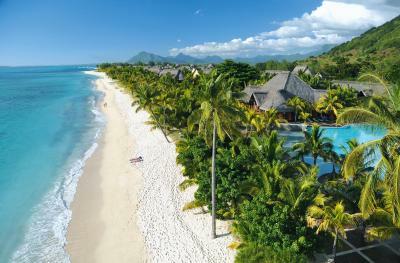 Cascading pools dotted with islets bright with flowers, spacious wooden decks, terraces designed with sea views and tropical gardens planted with exotic trees make Dinarobin the symbol of tropical elegance in Mauritius. 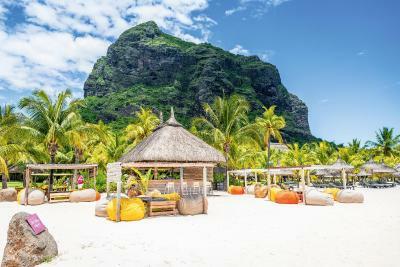 Located on the most scenic shoreline in Mauritius with the spectacular Le Morne mountain acting as a dramatic backdrop, Dinarobin offers an intimate village setting. The resort features luxurious all-suite accommodation that blends harmoniously into the lush tropical gardens"
House Rules Dinarobin Beachcomber Golf Resort & Spa takes special requests – add in the next step! As you can see, the hotel is not a cheap one, but it totally worth its money. You get great survice and very relaxing time for the money. However, there were just a couple of weird things I can not really understand. 1. You can have only a single free bottle of water per day per 2 persons (even if you have half board included!) which is absolutely not enough. Water is not that expensive but the fact that you have to pay for it every day is just ridiculous. 2. If you have a half board included and you go to japanese restaturant keep in mind you won't have a choice of starter, main dish and dessert (as in other restaurants). Instead, you have "credits" which you can spend on the dishes from a list and if those credits do not cover you choice (and it ususally does not) you have to pay extra. In theory you can spend withinn the limits, but if you want a main dish you will probably pay extra. Connecting rooms even when used separately can hear too much from room next door, However staff at reception were accommodating and resolved the issue, but worrying if resort is full. Internet was weak and it didnt have modern features such as enough plugs, usb, tv quality etc. The food and spa are not at the same level of awesomeness as the resort is. Very mediocre meals for double the price - we tried the Italian and the Japanese restaurant. Breakfast was great however. Spa was average, but had lovely staff. We wanted to reserve our return to the airport with the company that we had reserved when we arrived. The tour operater was present in the morning from 9:00 to 12:00. We went to see her and she was with a couple and had us wait 40 mins. I tiired of waiting and asked the reception if we could reserve a taxi. Which was totally possible. The operater came to us after to ask to help. We listened to her but the difference between the tariffs were 30 euros! We went ith the taxi and it was fine. The tour operateur was Mautourco. All was really perfect. I can´t really find anything I did not like. WiFi could be better as sometimes connectivity is not as desired. Location itself is perfect for leisure, but at the same time it means that nearest villages/shops/cafes are not in the walking distance. Really beautiful and clean beaches, very helpful and nice staff, a lot of activities (gym, spa, golf, water sports). Perfect experience for leisure. Suites and all the infrastructure are almost perfect. Everything! The room, the food, the water activities, the staff and of course the beautiful beach. The environment is peaceful, but there will always be staff who can help you if needed. You can also book the restaurants in Paradise Hotel, thus you may have more choices on varieties of food in case you need to stay here for several days. The free shuttle bus will take you to their sister hotel. The amazing location under Le Morne on a perfect beach. The quiet and peaceful surroundings. Super comfortable beds. The exquisite food. The incredible attention to detail of the staff.